Houghton Mifflin Harcourt, 9780544370081, 160pp. A smoothie might just be the perfect family food: an easy and delicious way to get kids and adults alike to eat more healthfully. A blessing for busy parents, they are whipped up in minutes, perfectly portable, and enjoyed by even the pickiest eaters. 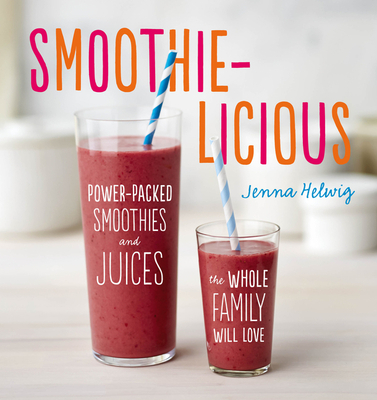 In Smoothie-licious, Parents magazine editor Jenna Helwig shows how to make 75 smoothies and whole-fruit juices that are both healthy and delicious. Kids will love the bright colors and playful names like Peanut Berry Blast and Mexican Frozen Hot Chocolate; parents will love that they feature nutrient-dense seeds, dark greens and fresh fruit, and use no refined sugars. Nutrition information accompanies every recipe and icon note high sources of vitamins and minerals as well as vegan, gluten free, and meal-in-a-glass smoothies. A treats chapter turns smoothies into fun popsicles, slushes, and shakes.